· Made for Travel. Soft-sided and modern. Space for your personal gear. That’s what you get with thediscreet, protective and versatile Passport Series. · Main Color Grey, with purple highlights. · Fits Mirrorless or compact DSLR plus extra lens,flash. The shoulder strap with removable shoulder pad can be adjusted in length to ensure a comfortable fit. This may be because you made an impulse buy or simply chose the wrong item. It is not a "try before you buy period". Space for your personal gear. Space for your tablet. Adjustable shoulder strap with cam lock buckle. LOWEPRO PASSPORT SLING III. The Lowepro Passport Sling is convincing for several reasons The bag with the zipper open expansion allows you to stow in addition to fotgrafico Kit as well as other personal belongings. Space for your tablet. This is what you get with the Passport, discreet, protective and versatile bag. Prodotto non nazionale No. Paese di fabbricazione Cina. Review Lowepro. Detachable Shoulder Pad. IN THE BOX. Weight 1.1 lb / 0.5 kg. Lowepro LP36658 Passport Sling III Camera Bag - Grey. Space for your personal gear. Space for your tablet. That's what you get with the discreet, protective and versatile Passport Series. Adjustable shoulder strap with cam lock buckle. Item model number: LP36658. Space for your personal gear. Space for your tablet. That's what you get with the discreet, protective and versatile Passport Series. Adjustable shoulder strap with cam lock buckle. Adjustable shoulder strap with cam lock buckle. We will do our best to turn any less than satisfactory experience into a positive one. CradleFit System tablet pocket. Space for your personal gear. Space for your tablet. Adjustable shoulder strap with cam lock buckle. CradleFit System tablet pocket. Space for your personal gear. Space for your tablet. That's what you get with the discreet, protective and versatile Passport Series. Adjustable shoulder strap with cam lock buckle and removable shoulder pad for extra wearing comfort. THIS IS A GENUINE ITEM MANUFACTURED BY LOWEPRO . 210D Nylon Brushed Tricot. Lowepro Passport Sling Specs. The Passport Sling is carried by an attached, shoulder strap with a cam lock buckle that easily adjusts for an ideal fit and a removable, sliding shoulder pad with non-slip patch. THIS IS A GENUINE ITEM MANUFACTURED BY LOWEPRO . 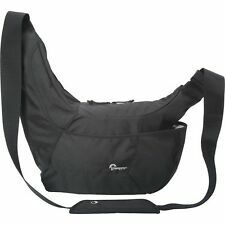 Lowepro Passport Sling III (Black). To carry the sling, there is an attached adjustable shoulder strap, with a detachable shoulder pad for comfort. THIS IS A GENUINE ITEM MANUFACTURED BY LOWEPRO . 210D Nylon Brushed Tricot. The Passport Sling is carried by an attached, shoulder strap with a cam lock buckle that easily adjusts for an ideal fit and a removable, sliding shoulder pad with non-slip patch. THIS IS A GENUINE ITEM MANUFACTURED BY LOWEPRO . The Passport Sling is carried by an attached, shoulder strap with a cam lock buckle that easily adjusts for an ideal fit and a removable, sliding shoulder pad with non-slip patch. THIS IS A GENUINE ITEM MANUFACTURED BY LOWEPRO . Lowepro Passport Sling III (Gray & Orange). To carry the sling, there is an attached adjustable shoulder strap, with a detachable shoulder pad for comfort.